Normally the publisher maintains the website of a subscription journal. Generally I think that publishers are not really interested in additional work like maintaining a data archive, as long as they don’t earn money with these additional services. But this is only one site of the coin. Also in the publisher’s sector (Brussels Declaration) or with the announcement of a data citation index by Thompson Reuters it is quite obvious that publishers and companies are on the move and that they are discussing about research data in journals and even potenial business models. Some journals as Earth System Science Data even publish peer-revied research data. But nevertheless, for the vast majority of traditional journals I’m quite sure that publishers consider the management of a data archive as additional work only, what might be seen as a chance for open access journals. The editors of open access journals know almost very well how to establish a data archive. 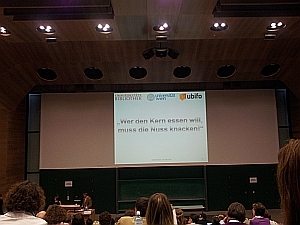 From a technical point of view it shouldn’t be too hard to implement one of the software solutions available (e.g. Nesstar, Dataverse, CKAN/thedatahub). A very good exmaple of an economic scholarly open access journals is the Economics E-Journal that implemented a data archive based on Dataverse. When I take into account, that OA-journals disseminate the articles quicker than traditional subscription journals and that articles in open access journals are cited more often than articles in traditional journals (and citations are very important for economists) I would assume that OA-journals should be on the forefront of of the scientfic debate. When we implicate that articles with accompagning datasets are cited even more often someone might assume that Open Access Journals will use these advantages to establish themselves in the scientific publishing market. Because of these two advantages OA-journals therefore should be important journals in the market for reproductible research. They can estabish their place in the market with quality assured and peer-reviewed articles that are equipped with data and code. Based on these assumptions we analysed 43 economic Journals that are listed in the DOAJ (rubric: Economics). We used a sample of OA-journals that primarily publish articles in English. As we did it with the 141 journals in our sample for work package 2, we checked the journal website(s) for data (availability) policies: If we found a data policy we used some criteria to gauge the quality of these data policies. Well, the sad result is that only two (!) open access journals in our sample are equipped with a data policy (4,65%). In sharp contrast to these findings we were able to find 28 journals in a sample of 140 subscription journals (20%). Because of the marginal percentage of OA-journals equipped with a data policy, we did not analyse the data policies in depth. One of the two OA-journals has already been analysed in wok package 2. 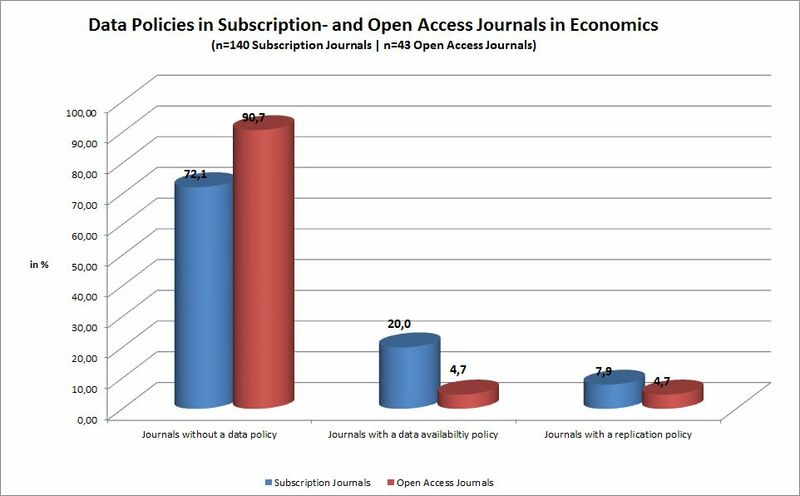 In my opinion this journal (Economics, the Open Access, Open Assessment E-Journal) is a very good example of how OA journals might use their respective advantages to position in the market. The E-Journal did it. It is ranked in the Journal Citation Report and has established in the market. Besides, it is equipped with a a very useful data availability policy, based on the data availability policy of the American Economic Review (AER). So in my opinion the publishers of the OA-journals have missed their chance to establish in the market for reproducible research up to now. Maybe the editors of open acces journals should think about these results and try to estabilsh themselves in the market for reproductible research. At least in my opinion they will benefit from doing so.